SlashData Developer Economics is the leading research programme on mobile, desktop, IoT, cloud, web, game, augmented and virtual reality, and machine learning developers as well as data scientists, tracking the developer experience across platforms, revenues, apps, languages, tools, APIs, segments and regions. 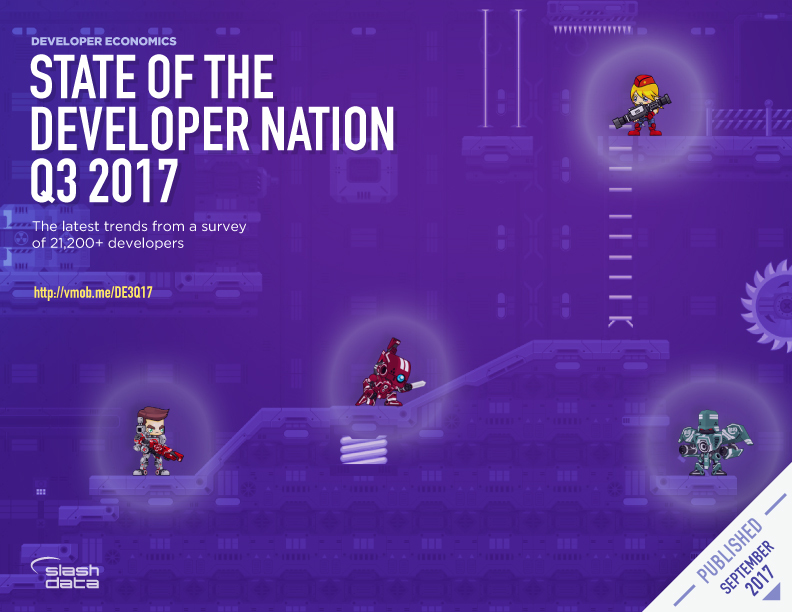 The 13th Developer Economics global survey wave ran in April to June 2017 and reached more than 21,200 developers in 157 countries. This research report delves into key developer trends for 2017. The report focuses on five major themes – each with its own visualisation, showing how the data lends insight into the developer community. 1.Developers have become key stakeholders in recent years when it comes to making technology decisions in companies. Our data show just how far their influence reaches. 2.Game developers are often the first to exploit new technologies; their decisions may decide which hardware platforms become king of the hill in the future. We take a closer look at where they are placing their bets today. 3.We all know that developers can get quite tribal about the languages and technologies they use. Flame wars galore on the internet. But how much is that reflected in their actual platform choices? 4.Internet of Things technology can add a lot of complexity to what used to be much simpler objects. What makes it so challenging? We look at which parts of IoT are most likely to cause trouble: the hardware, the software, or the data? 5.The world of backend and cloud technology continues to be a fast-moving, ever-changing space. We investigate how the focus of developers shifts between technologies and levels of abstraction. Developer Economics 13th edition reached an impressive 21,200+ respondents from 157 countries around the world. As such, the Developer Economics series continues to be the most global independent research on mobile, desktop, IoT, cloud, web, game, AR/VR and machine learning developers and data scientists combined ever conducted. The report is based on a large-scale online developer survey designed, produced and carried out by SlashData over a period of nine weeks between April and June 2017. Respondents to the online survey came from 157 countries, including major app, machine learning and IoT development hotspots such as the US, China, India, Israel, UK and Russia and stretching all the way to Kenya, Brazil and Jordan. The geographic reach of this survey is truly reflective of the global scale of the developer economy. The online survey was translated into seven languages in addition to English (simplified Chinese, Japanese, Korean, Portuguese, Russian, Spanish, and Vietnamese) and promoted by 82 leading community and media partners within the software development industry.